U.S. Vietnam policy was built on twenty-five years of lies. The Vietnamese fought Japanese occupation during World War II and sought a free Vietnam after the war free of colonial control. Eisenhower, Kennedy, Johnson and Nixon lied about their escalation of the United States involvement. The only way America can avoid becoming "waist deep in the big muddy" again and again is to clearly understand its history. The Power of Protest. Telling the Truth - May 1 - 2. Pete Seeger - "Waist Deep In The Big Muddy"
Journalist Sheryl Gay Stolberg recently reported on the Pentagon's development of public educational materials concerning the history of the Vietnam War. In addition to preparations for a 50th year commemoration of President Johnson's escalation of the war in 1965, DOD has been posting a war "timeline" on their website. The project was initiated by Congress in 2008 and will cost some $15 million ("Paying Respects, Pentagon Revives Vietnam, and War Over Truth," New York Times, October 9, 2014). Perusing the timeline, a discerning reader would discover an oversimplified, distorted, and ahistorical narrative about the role of the United States in Vietnam. What is being presented as official history reduces the possibility that future generations of Americans will be able to learn from the mistakes of the past. For starters, the narrative needs to develop eight elements of the United States/Vietnam story that are either missing from the timeline entirely or are grossly oversimplified. First, it is critical to remember that the Indochinese peninsula, what became North and South Vietnam, Laos, and Cambodia, was a colony of France from the 1850s until the Japanese occupation during the Second World War. After the war, the French sought to reestablish their Southeast Asian empire. They refused to negotiate with the Vietnamese, who demanded independence. What ensued was the bloody French/Indochinese War from 1946 until 1954. The French, defeated in 1954, were forced to withdraw. From 1950 until 1954, the United States funded 80 per cent of the French war effort while fighting in Korea, negotiating to construct a military alliance in Southeast Asia, and building an anti-communist network of states elsewhere in Asia. Second, an agreement to end the French/Indochina War was achieved at the Geneva Conference of May, 1954. The Geneva Accords granted the three Indochinese states independence, required the withdrawal of all outside military forces from Vietnam, and temporarily divided Vietnam at the 17th parallel. Within two years there were to be all-Vietnamese elections to establish one government. Despite the fact that the United States did not sign the Geneva Accords, a statement was issued promising support for them if all parties acted as agreed. The United States, in violation of Geneva, created a new government in the South and picked an autocrat, Ngo Dinh Diem, to lead a new government there. Diem announced that the South would not participate in the expected elections. Thus, what was to be a temporary administrative division of Vietnam became permanent by fiat. Third, it must be concluded that every president from World War II through Gerald Ford, engaged in policies to oppose the wishes of the Vietnam people. The United States played a central and negative role in Indochina; from supporting the French effort to reestablish its colony, to imposing the Diem family on South Vietnam, to covertly attacking targets in the North, to fighting in the South, and to massively bombing all across the peninsula in Laos and Cambodia as well as North and South Vietnam. Fourth, United States military operations, which began with President Eisenhower sending 1,000 "advisors" to South Vietnam, expanded to 540,000 troops in combat operations by 1968. In addition, United States covert agencies, including the Central Intelligence Agency, engaged in policies of assassinations, moving populations, and in other ways undermining South Vietnamese society. Intervention was economic and cultural as well as military as major United States corporations established projects in Saigon with wealthy South Vietnamese investors. Fifth, the Johnson and Nixon Administrations launched horrific bombing campaigns, hitting targets in the South and later the North. After an attack on a U.S. military base at Pleiku in South Vietnam during February, 1965, the Johnson Administration initiated Operation Rolling Thunder. This was a three-year non-stop bombing campaign with large areas of South Vietnam and parts of North Vietnam declared "free fire zones." Between 1965 and 1971, 142 pounds of explosives per acre had been dropped on Vietnam equal to 584 pounds per person. One hundred eighteen pounds of explosives were detonated per second. The total magnitude of bombing equaled 450 Hiroshima-sized bombs. The rural landscape was destroyed, devastating key rural industries such as rubber and timber production, and disease and death spread. The bombing increased migration to Saigon (now Ho Chi Minh City). Corruption, prostitution, and drug trafficking expanded in the over-populated city. By the end of 1967 more bombs had been unleashed on Vietnam than during the entire European phase of World War II. Children in the village of Trang Bang, after brutal napalm bombing. Kim Phuc was 9 years old, when she was running, with third-degree burns over half her body. Sixth, the Vietnamese and United States troops were victimized by massive amounts of Agent Orange released on people and the rural landscape; twenty-one million gallons of herbicides between 1961 and 1971. One-quarter of South Vietnam had been sprayed to destroy crops. Thirty-six percent of rice-growing swamps were made unfit for cultivation by 1974 and 30,000 Vietnamese hamlets, five million villagers, were victims of direct spraying. Dioxin, a deadly element of Agent Orange produced by Monsanto and Dow Chemical, created a broad range of cancers, diabetes, heart disease, and Parkinson's disease. Genetic abnormalities still exist today as children are born with gruesome physical deformities and twenty-eight "hotspots" still exist in South and Central Vietnam that endanger local populations. Seventh, the Vietnam policy was built on twenty-five years of lies. The Vietnamese who fought the Japanese occupation during World War II and sought a free Vietnam after the war were authentic nationalists, committed to establishing an independent country free of colonial control. Each president lied about their escalation of the United States role by claiming that the Vietnamese fighting the United States and the Saigon government were mere puppets of Chinese or Soviet communism. Eisenhower lied when he claimed that if Vietnam "fell," the rest of the region would as well, the simplistic domino theory. Kennedy lied when he claimed that the Diem family running the South Vietnamese government, the police, the military and those who controlled the land constituted democratic tendencies in South East Asia. Johnson lied when he claimed that the North Vietnamese engaged in an unprovoked attack on U.S. naval vessels in the Gulf of Tonkin. And Richard Nixon lied when his advisor declared that "peace is at hand" just before the 1972 election. After that election Nixon launched the most massive lethal bombing campaign against targets all across North and South Vietnam, the so-called "Christmas bombing." Finally, contrary to media distortions, most anti-war activists regretted that young men and women were drafted to fight in an unjust and immoral war. The peace movement knew that most of those who fought in Vietnam, were drafted or enlisted because of their economic disadvantage and/or racism at home. American soldiers, like their Vietnamese comrades, were victims of a murderous war that cost millions killed and maimed. There were no heroes and heroines during these troubled times but any accurate timeline must celebrate both the soldiers and the anti-war activists who sacrificed their privilege, their educational opportunities, even their citizenship to say "no" to war. The only way America can avoid becoming "waist deep in the big muddy" again and again is to clearly understand its history. That is what the official timeline is designed to resist. Without a clear understanding of the past "the big fool," whoever he or she might be, will successfully convince the American people "to push on." (For more of the history of the United States war in Vietnam and how that country has developed since the end of the war see Duncan McFarland, Paul Krehbiel, and Harry Targ editors, Vietnam, From National Liberation to 21st Century Socialism, Committees of Correspondence Education Fund, Changemaker Publications, 2013). 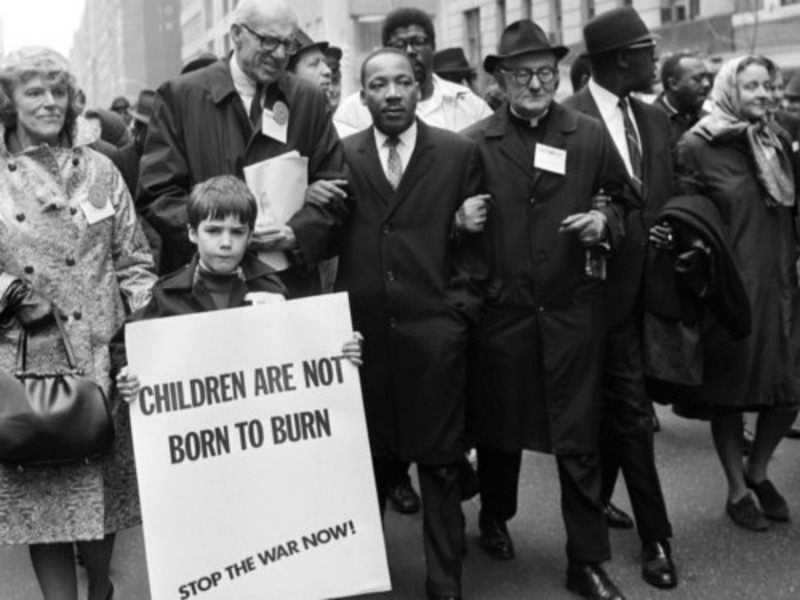 Fifty years ago, millions of Americans -- including the most important voices of conscience of the time -- joined in what became the largest peace movement in American history. To be in the Vietnam peace movement required moral and physical courage, commitment, and a willingness to sacrifice our own liberty, careers, friends and family relationships. On May 1-2, 2015, we are gathering again in Washington to talk about how we helped end the Vietnam War, what it was like to be part of the movement, how it changed us, and what lessons we can learn from the experience. This effort began last Fall in reaction to Pentagon plans for a Vietnam War Commemoration, ostensibly with a mandate to honor Vietnam-era veterans. We were astonished to see that they had created a website with a one-sided version of the war's history and that they were planning on developing curriculum that would be taught in thousands of schools. The New York Times gave the story front-page coverage, and all references to classroom materials were quickly removed from the website. We met with key Pentagon Commemoration officials in January and made progress. They confirmed they were no longer pursuing the curriculum project and intended to revise the time line and seek independent assessment of its content by recognized scholars. Clearly, the power of Vietnam protest still works. But, we have to remain vigilant. The time line so far has been modified in only limited ways. The official commemoration goes on for a decade and aspires to tens of thousand of local activities in every part of the US -- including in middle and high schools and on college campuses. The momentum from this fight motivated us to plan a major conference on May 1-2 and to broaden our goals. Not only do we want to continuing fighting to make sure that the truth is told about what happened during the war and about its enduring human consequences; but we also want to insist that, given the world situation today, the lessons of unnecessary and unmerited military intervention must finally be learned. Most importantly, we want to remind America about the transformative role of the movement against the war for our country and for its victims in Vietnam, Laos and Cambodia. Hundreds of us of us will be gathering at the New York Presbyterian Church in DC -- a church which played a memorable role as a meeting place and staging area for the huge anti-war mobilizations of the late 60s and early 70s. Leaders and activists from the struggle to end the war will join with young justice-fighters to reflect on and raise up the mass movement of 50 years ago and to deepen the links and lessons for the challenges we face today. Highlights of our conference will include: honoring the Elders of our movement on Friday evening; a commemorative walk past the Vietnam Veterans Memorial to the Martin Luther King Memorial on Saturday afternoon; plenaries, mini-plenaries, workshops and breakout groups for sharing analyses, remembrances and dreams; and songs, poetry, artwork and celebration. Let's transform the experiences of yesterday into a call to action for today. Join Tom Hayden, Ron Dellums, Cora Weiss, Rosalio Munoz, Holly Near, Dan Ellsberg, Julian Bond, Marge Tabankin, Pat Schroeder and many, many others on May 1-2. You will want to be at this historic and challenging gathering. Please review the draft agenda here. Additional speakers are being confirmed, but the strength and value of the event lie in those like yourself who choose to come together in Washington May 1 - 2. Register here and help spread the word to current and former friends, comrades and colleagues. We in Veterans For Peace (VFP) invite you to join us as we put together a special Memorial Day 2015 service. As many of you know, the year 2015 marks the fiftieth anniversary of what some consider to be the beginning of the American War in Vietnam -- the deployment of the U.S. Marines to DaNang. The Department of Defense is very aware of the significance of this year and has mounted a heavily funded initiative to make sure that the younger generations of this country see the Vietnam War as a noble enterprise. Included in their efforts is a well-funded website as well as plans for annual celebrations, such as Memorial Day events around the country. They are planning to tell their version of the war for the next ten years. However, we know that many of us disagree with their perspective, who see the war as, at the least, a grievous mistake if not an horrific crime. As we have already seen, the Pentagon will downplay or ignore this perspective in their narrative of the war. Thus, we in VFP have pledged to meet their campaign with one of our own -- we call it the Vietnam War Full Disclosure movement. Please join us in more fully opening up the dialogue of how the history of the American War in Vietnam has to be told. We need to hear your voice. To begin with, we need you to write a letter. A special letter. We are calling on concerned citizens who have been seared by this war to each send a letter addressing the Vietnam War Memorial (The Wall) in Washington, DC directly. We are asking you to share your memories of this war and its impact on your loved ones while expressing your concerns over future wars. Direct your words to those who died in the American War on Vietnam. At noon on Memorial Day, May 25, 2015, we will place these letters at the foot of the Wall in Washington, DC as a form of remembrance. As a Vietnam War veteran myself, I share with many the belief that the Wall is no place for political events. I consider it to be sacred ground and will not dishonor this memorial with a political act. The placing of our letters at the Wall will be treated as a service, a commemoration of the terrible toll that war took on American and Southeast Asian families. And as a trumpet call for peace. Once the letters have been placed, those of us who served in Vietnam will "walk the Wall," i.e., we will continue to mourn our brothers and sisters by starting at the panel commemorating our arrival in Vietnam and finishing at the panel marking our departure from Vietnam. For me that involves a walk of about 25 paces, taking into account approximately 9800 American lives. But we will not stop there. We will continue walking beyond the confines of the Wall to memorialize the approximately six million Southeast Asian lives also lost during that war. This will be a symbolic act, for if we were to walk the total distance needed to commemorate those lives lost, using the model of the Wall, we would need to pace 9.6 miles, a walk equivalent to the distance from the Lincoln Memorial to Chevy Chase, Maryland. Nevertheless, we will carry the memory of those lives as best we can. If you wish to physically join us on May 25th, please let us know beforehand by contacting us at the above addresses. Please stay in touch with us by visiting http://www.vietnamfulldisclosure.org/. And if you wish to make a donation to help us defray the costs of our action, feel free to do so by sending a check to the Vietnam Full Disclosure committee at Full Disclosure, Veterans For Peace, 409 Ferguson Rd., Chapel Hill, NC 27516.